If you have questions or get stuck, browse the FAQ to find your answers! What is BOOKR Kids Library? The BOOKR Kids Library is an application for smartphones and tablets that offers a digital library especially for kids. Most of the stories are digital versions of already published print books, including special features like animation, narration by actors, text highlighting and educational games. What age group do you recommend BOOKR Kids to? Based on its content (board books, picturebooks, story books, easy readers) the library suggested for kids between 2 and 11. In which operation systems does the application work? It works on iOS and Android and it is not yet available on Windows Phone. Can I use the app on my computer? No, the app is not available on computer. How do I get access to the Library? You can download the app for free from Google Play (in case of an Android device), and from the App Store (in case of an Apple device). Some of the books are always available for free within the BOOKR Kids Library, but in order to have an access to the entire library, a valid subscription is required. Is internet connection required to access the Library? Internet is needed to download books from the Library, but after that the downloaded books can be read offline. On the welcome screen you set your age with the help of the BOOKR Kids bunny and then tap on “Enter the library” sign. Now you see the full library! Where can I find my downloaded books? On the shelves you will see all the recommended books, including free and only-subscription accessible books, the already downloaded and not yet downloaded stories. At the bottom of the Library there’s a shelf, which shows all your downloaded stories. Internet connection is necessary to browse in the Library, however the previously downloaded stories on the shelf can be read offline. I entered with my signed up e-mail address and although I have access to my subscription, the previously downloaded books are not on my shelf. The application only downloads the books on the used device. So when you download books on your tablet, those books can be read on you tablet. When you download books on your smartphone, those books are available on your smartphone. Are there any free books on the application? Yes, usually around 10 stories are always free of charge to read. These books change every few weeks. How many books are in the Library? The content of the Library is constantly expanding, there’s at least one story coming up every week! Currently, there are hundreds of books in the Library. In how many languages are the stories available? Currently you can download books in three languages: Hungarian, English and German. Where can I find the games? The games are hidden among the pages of books – mostly they appear at the end of them. I previously downloaded the free books, but I can’t read them anymore, because it requests subscription. These books can only be read until they are free or the user has a valid subscription. Probably these stories you downloaded are not free anymore so you can only reach them with a valid subscription. We suggest you to browse from the other free stories or to buy a subscription! What happens with the downloaded books after my subscription expires? After the expiration of your subscription, the downloaded stories cannot be read anymore. To prolong your subscription, go to our website or look for the Settings panel and Subscribe option within the app. With a valid subscription the books can be read again. Does narration belong to all stories? Yes, every book is narrated by professional actors! You can turn on and off the narration by clicking on the “Mouth” icon on the bottom left corner after you tap on “Pause”. Can I read the stories only with narration? No, you can turn on and off the narration by clicking on the “Mouth” icon on the bottom left corner after you tap on “Pause”. This way you or your child can read the stories for yourselves! How do I know how long a story is? You can see the number of pages after opening a story, by taping on “Pause” button. How can I delete the downloaded books from my shelf? You can manage your storage and delete the downloaded books in the Setting panel, Storage option. The book’s downloading is interrupted. What can I do? After connecting to the Internet, downloading continues automatically. If downloading gets stuck, delete the book and then try downloading it again. How do I receive information on your new books? About our latest books you find pieces of information by subscribing to our Facebook page and to our newsletter! Can I only reach BOOKR Kids Library with a subscription? The app can be downloaded for free from App Store and Google Play and a few of the stories can always be read for free. To reach all books of the app, you must have an active subscription. As long as you are subscribed, you have an unlimited access, while after it expires, you can only reach the content that is free at that period. Without a subscription you cannot read your previously downloaded books either – for this you need to renew your subscription. How can I subscribe to the BOOKR Kids Library? on the BOOKR Kids website. BOOKR Kids Library is currently accessible with one, three and six month subscriptions. 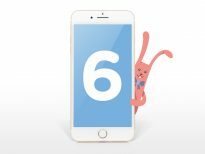 The one and three month subscriptions – purchased through the app – are automatically renewed, while the six month one expires. You can renew your subscription in the app or on our website. Can I only access BOOKR Kids Library with a registered account? No, the free books are accessible for anyone, but signing up is required to access the full BOOKR Kids Library. You can simply enter the Library with your Facebook and Google account or with giving your valid e-mail address. When you are purchasing a subscription, e-mail address must be given! Is my subscription valid for only one device? No, the subscription is available on more devices, but only if you purchase a subscription with your email address. 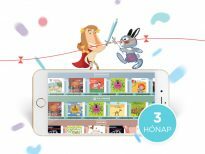 In this case, with your signed up email address you have an access to BOOKR Kids Library subscription on different devices, but only one at a time. Can the subscription be given as a gift? Yes, it can be! The best if you buy a BOOKR Kids Gift Card, which is a stylish card hiding a subscription code for full access to the Library. Where do I have to enter the received activation coupon code? The coupon code should be redeemed on the BOOKR Kids website. Enter with your previously signed up e-mail address (the one you used in the application) and redeem your 16 letter long coupon code, without using any space or dash. Your subscription is now valid in the app! I would like to purchase on Google Play/App Store. How do I get my subscription? The subscriptions purchased on Google Play and App Store are automatically activated, as soon as the payment arrives at the store. Before purchasing it’s necessary to log into the application with the previously signed up e-mail address! It is very important to wait until the transaction ends: don’t close the app as long as the Store doesn’t redirect you there! On the website I can choose from two different subscription options (bank card payment / advance payment reference). What is the difference between them? Purchasing through the “SimplePay” webshop, using a debit card is a simple and immediate way of payment. Once the system directs you to the bank’s interface, you just have to give your bank card details and if the payment is successful, a confirmation email is sent to your email address obtaining the 16 letter coupon code to activate your subscription with. 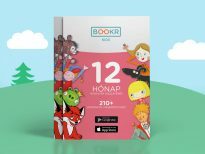 This coupon code can be validated on the BOOKR Kids website. The other method of payment is the advanced reference, which means you start the payment through your own bank to the Móra BOOKR Kids Kft. 10918001-00000076-51160002 bank account number. In this case, you will receive your activation code to your e-mail address when the subscription fee has arrived to our bank account. This depends on the speed of the transfers between bank accounts (probably 1-3 working days). When does the validity of the subscription begin? The subscription purchased within the application is valid after the payment is arrived, so normally within seconds. (It is very important to wait until the transaction ends: don’t close the app as long as the Store doesn’t redirect you there!) The coupon code subscriptions will become valid when you redeem the code on the BOOKR Kids website. I’ve seen that so called Storytablet can be purchased at Telekom with a BOOKR Kids subsciption. What does that exactly mean? 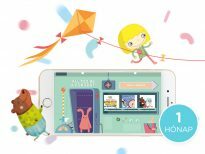 The offer of Telekom and BOOKR Kids includes a HuaweiMediapad T1 tablet and a six month BOOKR Kids subscription as a gift. Can this tablet be used for anything else than running the BOOKR Kids application? Can I only purchase this device at Telekom? What happens to the tablet if the Library’s subscription expires? The tablet can still be used, because it is a fully operating tablet. If you want to access the BOOKR Kids Library as well, prolong your subscription! Go to our website or or look for the Settings panel and Subscribe option within the app. With a valid subscription the books can be read again as well. After the subscription expires, only the free stories can be read. If you wish the reach the Library after the 6 month gift subscription, please prolong your subscription by going to our website or looking for the Settings panel and Subscribe option within the app. With a valid subscription you can reach the full library and your previously downloaded books again. I purchased a Telekom “Mesetablet”. How can I get my subscription? First of all, download BOOKR Kids app from Google Play. Then sign up or log in with your email address – your subscription is automatically activated! I downloaded the app, logged in with my email but I still cannot see my subscription. In this case please logout and restart the app. 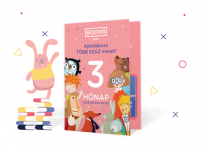 If you still cannot reach your subscription, please contact us at info@bookrkids.hu. My tablet is damaged / not working. Where can I find help in this case? If you purchased your tablet at Telekom, please turn to their customer service regarding the problems with the device itself. How long does the tablet's warranty last? The warranty of the tablet is one year, so we repair the warranty errors free of charge for one year from the date of purchase.